Birthday Card Stash - DONE!!! Hi everyone! Happy Friday! I am back today sharing another sneak peek of one of my cards for the Birthday Card Stash - DONE! class over on StampNation! 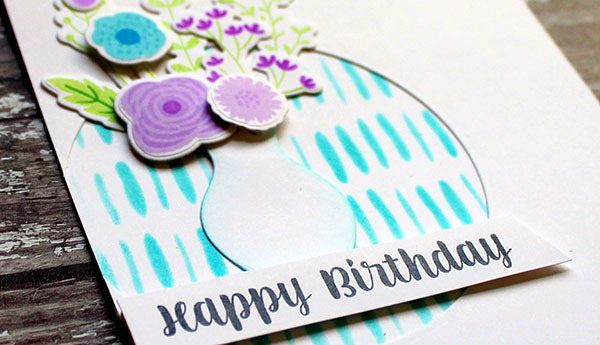 Today's tutorial is by My Favorite Things and it's all about birthday cards for women. 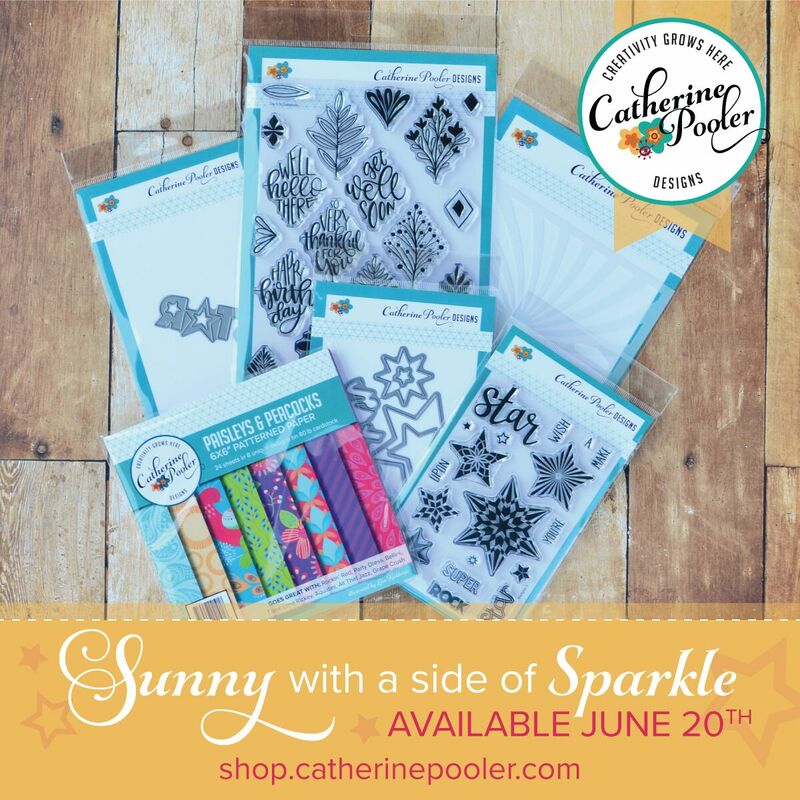 I bought the beautiful Blooms stamps and dies from MFT a while back. This is my first time using them and I don't know what has taken me so long to ink them up! They are so gorgeous and so easy to create a fabulous bouquet of flowers. 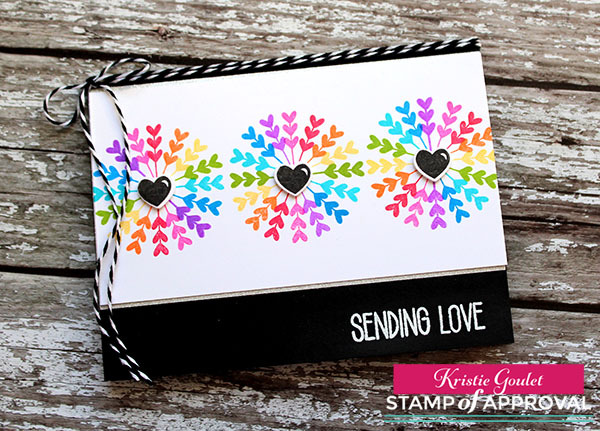 While I had my supplies out and was stamping, I stamped way more than I needed for one card and ended up being able to create 4 of these cards. 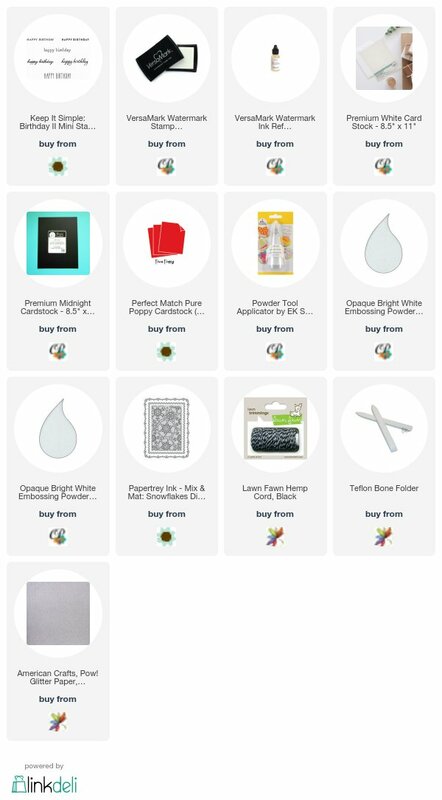 Why not when you have all the supplies out, right?! I used a stencil and sentiment from Papertrey Ink to finish off my card. 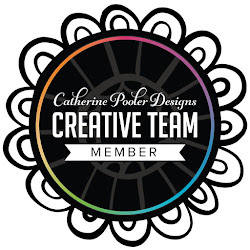 Not a member yet, click>>HERE<<for more info and to join today! Birthday Card Stash - DONE!! Hi everyone! I'm back today sharing a sneak peek of one of my cards for the Birthday Card Stash - DONE! class over on StampNation! Yesterday's tutorial was by Angelica Suarez the co-owner of Crafted in Joy. She created some very FUN card for kids! 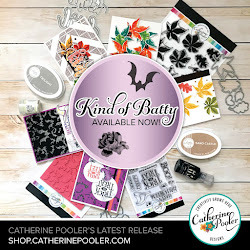 I used stamp sets by Catherine Pooler and Papertrey Ink. I pulled out one of my Kaleidacolor ink pads to use on this card. LOVE these colors together. Hi everyone! It's time again for another Seize the Birthday challenge. This time the "topping" is to create a One Layer card. 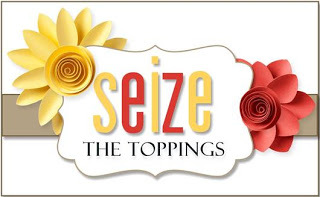 Remember, the "topping" is optional. My card is not a "true" one layer card, because I added a sentiment strip. I think we all define one layer cards a bit differently, as some would consider this a one layer card and others would not. No worries though, because the topping is always optional. I stamped the row of flowers from a retired Cas-ual Friday's stamp set in rainbow colors and added a black and white heat embossed sentiment. Love the impact of the rainbow colors. 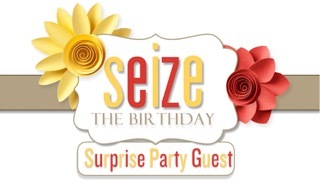 Hope you will join us over at Seize the Birthday! Hi everyone! 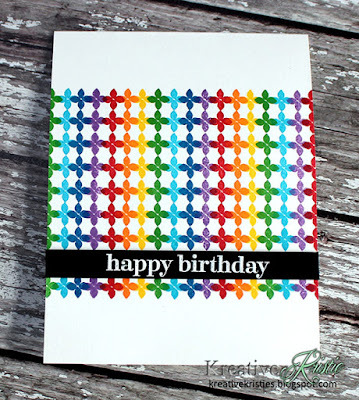 We have started a fun, new Birthday Celebration class over on StampNation! The class kicked off on Saturday with a fun tutorial by CAS-ual Fridays and today's tutorial by Winnie & Walter! 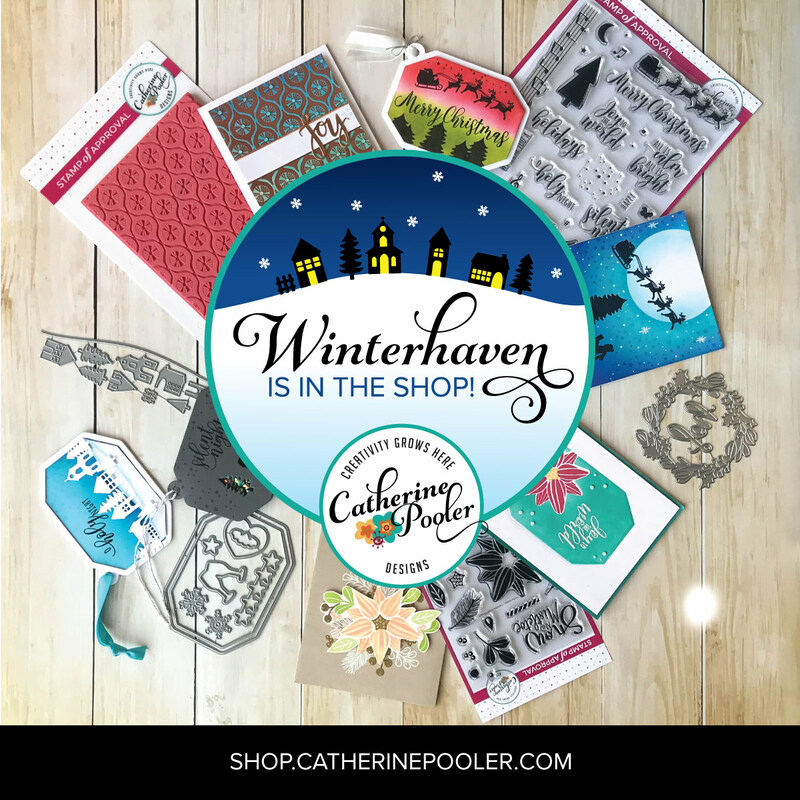 Since Winnie & Walter is the sponsor, I decided to create a card using some of their goodies. The tutorial for today is to create birthday cards to send to your BFF!! Today happens to be Catherine's birthday, so this one's for YOU!!! I used The Ring in the Celebration set that Winnie & Walter designed for the Stamp of Approval Young at Heart collection. I started by masking off my card panel and blending some distress oxide inks. After blending, I spattered some water to get some fun water marks. Made sure it was completely dry before stamping the images from the set. The sentiment is by Papertrey Ink. I followed the sketch over at SIP Challenge. 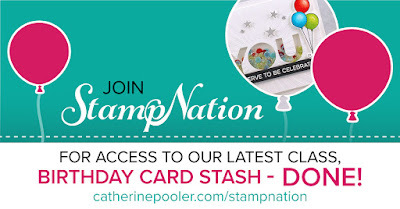 Click >>>HERE <<< to join us over on StampNation and participate in this fun class! Hi everyone! Happy Friday! I have another fun card to share with you using the goodies from the Stamp of Approval Love is in the Air collection. I have started seeing some gorgeous cards popping up all over social media with the collection. That is my favorite part-seeing what you all create! 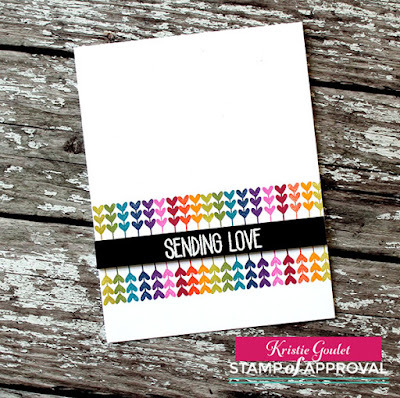 This card uses the awesome arrow stamp in the Love is in the Air stamp set. I definitely used my MISTI to get them lined up perfectly. I love how this turned out. I am going to add this over at CAS on Friday! 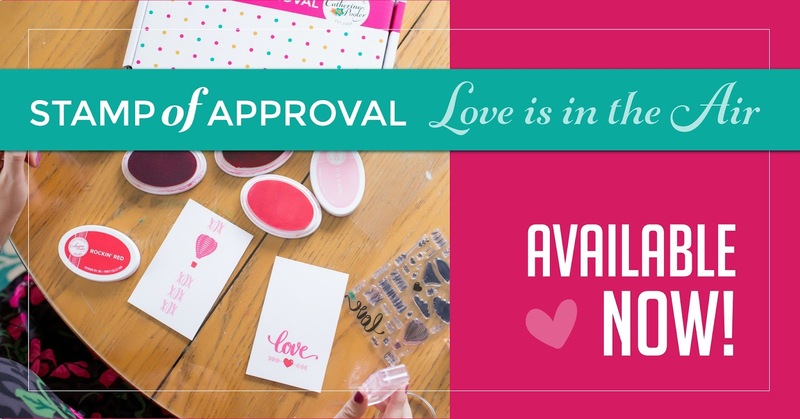 Love is in the Air Stamp of Approval Release Day! Hi everyone! 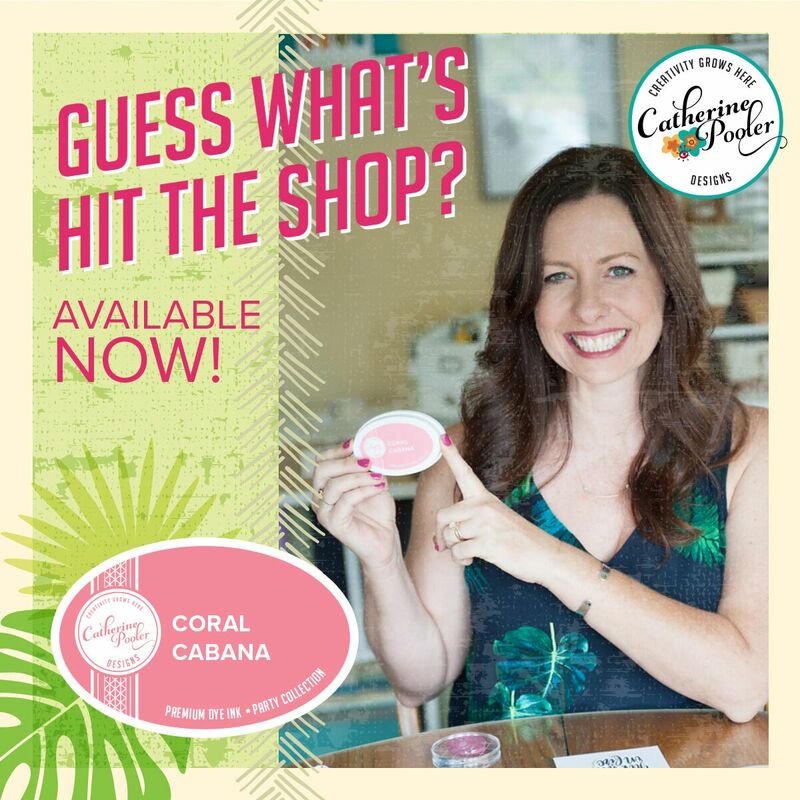 It's Release Day for the SOA Love is in the Air collection! 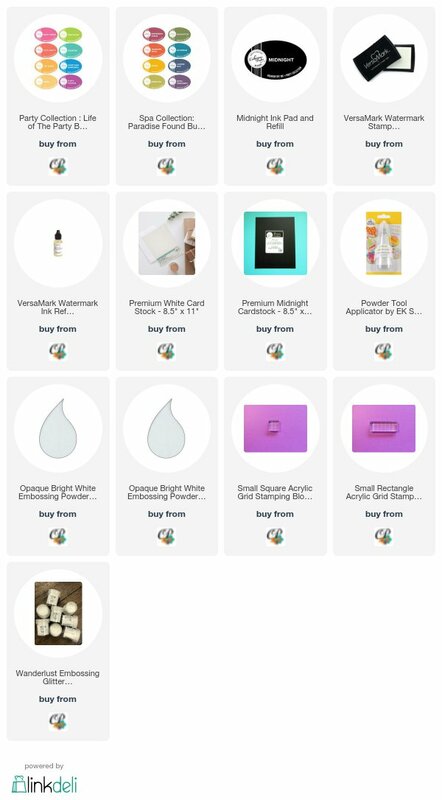 I have another card to share with you today using goodies from the collection! 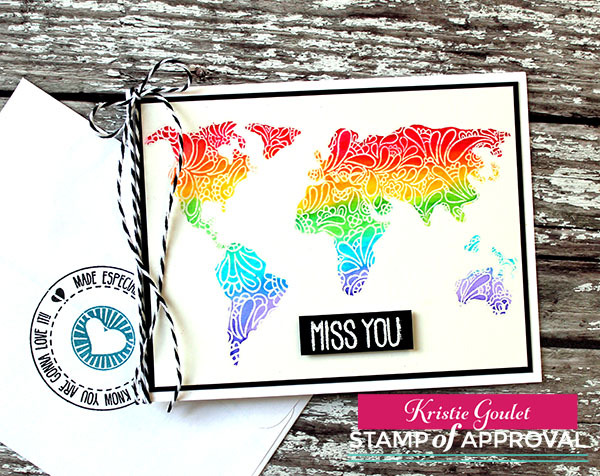 This card features the amazing The World Awaits, Happiness Enclosed & Bon Voyage stamp sets! 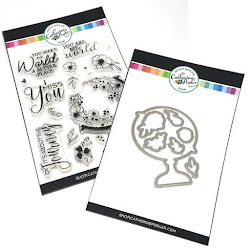 I stamped and clear heat embossed the world images onto a piece of Bristol Smooth cardstock. I then colored in the areas using my Zig Clean Color Brush Markers. I just love how bright these are and how well they blend on this watercolor paper. I added a white heat embossed sentiment and some black and white twine to finish off this pretty simple card! I wanna talk about the envelope too! 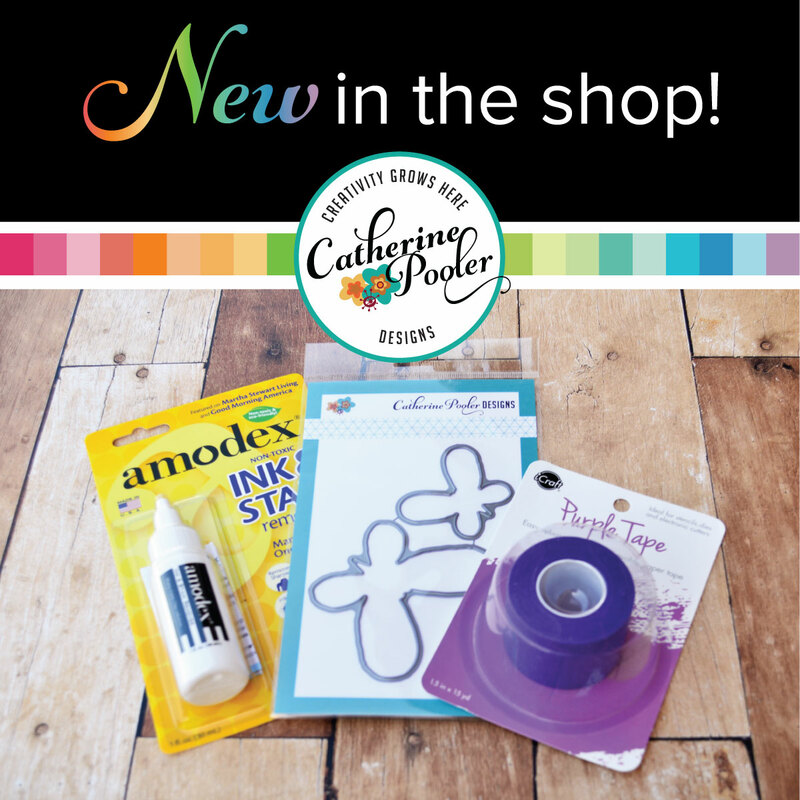 The Happiness Enclosed stamp set is perfect for adding special little touches to your envelopes! This stamp says "Made especially for you, so I know you are going to love it". 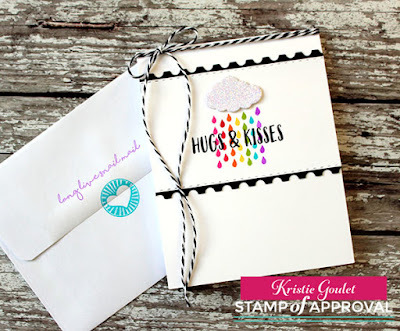 I love the heart that you can stamp on the inside of the sentiment too! 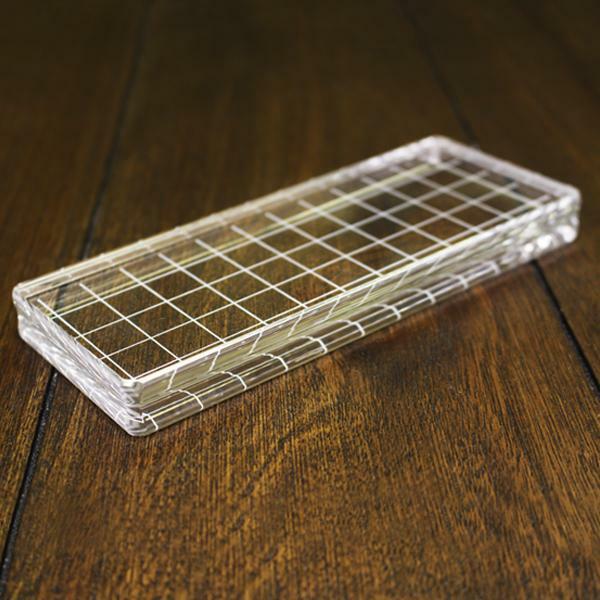 This is definitely a must have in your stamp room! 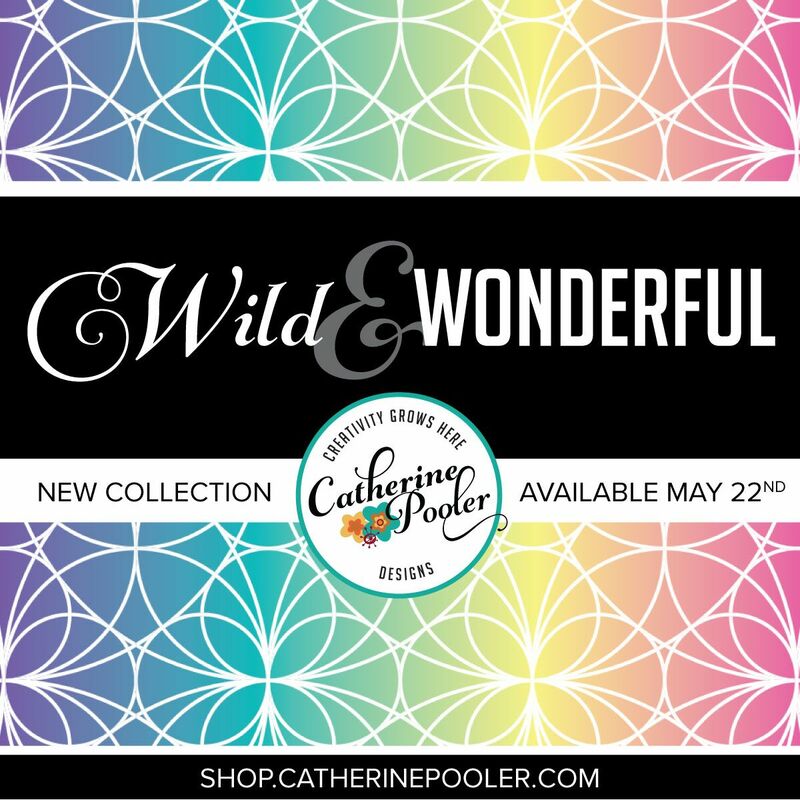 Have you seen the new blocks Catherine came out with? This rectangle block is a game changer for me, it's so perfect for many of the long border stamps Catherine has in her collections. Check it out!!! 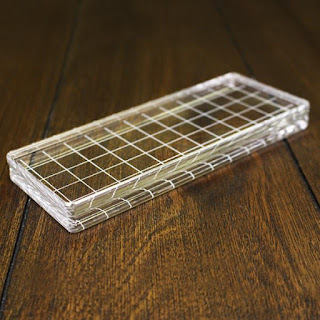 This block measures 2 1/2 x 6 1/8"
These blocks are perfection in my book!!! Catherine also has a NEW ROUND BLOCK that is just as amazing. You can find all the blocks in the links below. 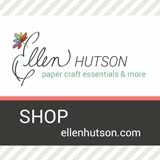 I hope you have enjoyed seeing my cards using this amazing collection. I look forward to seeing the many creations popping up all over Blog land when you all receive your collections. That is my favorite part! Hi everyone! 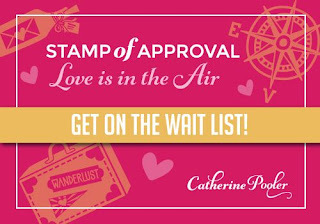 Today's the day-It's release day for the Stamp of Approval Love is in the Air collection for those on the Wait List. Hope you got your name on the list, these collections sell out quickly!!! If you are not on the Wait List and the collection doesn't sell out, ordering will open to the public tonight at 6pm. I have another card to share with you all today using the Postage Stamp dies, Bon Voyage Stamp set & Accoutrements dies. I started my card by die cutting the stitched rectangle panel from Kraft card stock and the postage stamp layer in white. 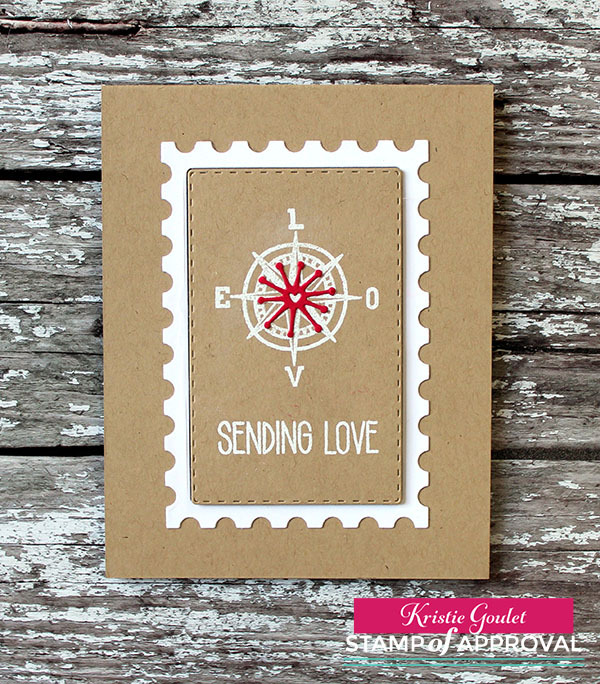 I stamped and white heat embossed the compass and sentiment. I attached these to a kraft card base. To add a pop of red, I used the direct to paper technique to color my white card stock red using Rockin' Red ink. 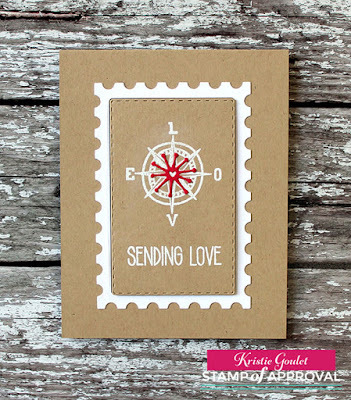 I then die cut this fun burst with a heart in the center and attached it to the center of the compass. Hi everyone! 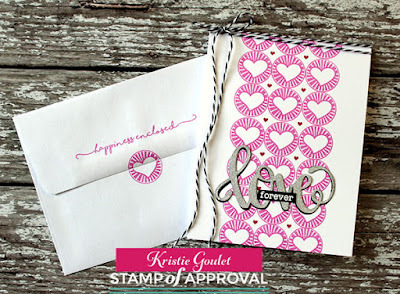 Today is the last day of the Stamp of Approval Love is in the Air Collection Blog Hops! 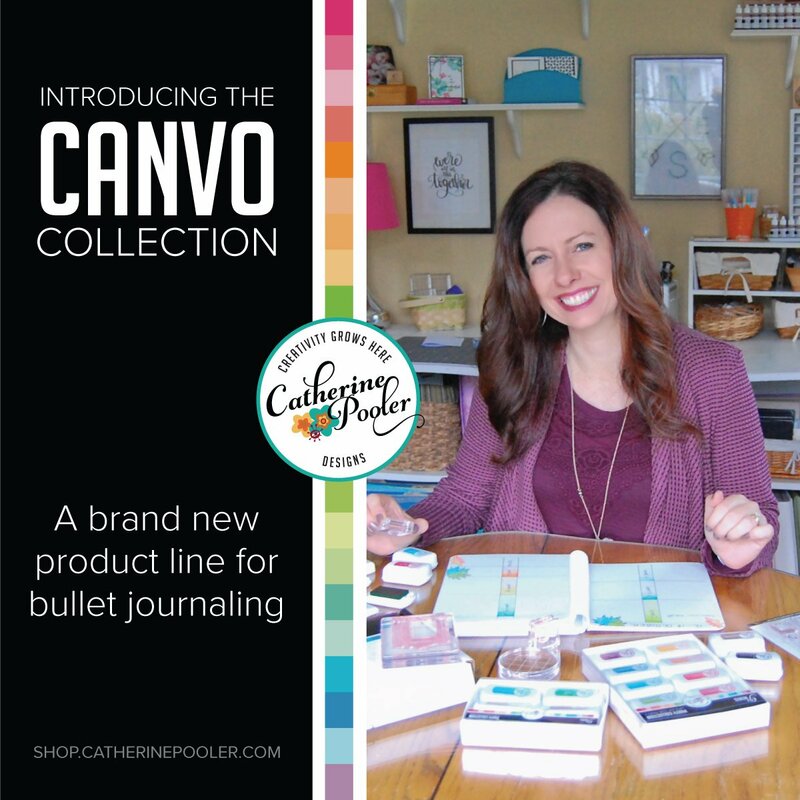 If you missed any of the days you can click below to start at Catherine's blog. Leave comments on each day of the hop for your chance to win the collection! 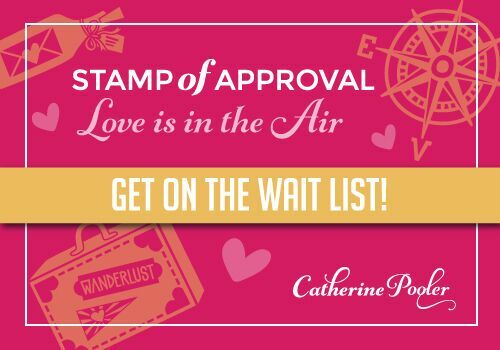 Get on the Wait List (click on the photo in my side bar) so you don't miss out! I have a couple more cards to share with you today using the Love is in the Air stamp set and the Add on coordinating die set! I was inspired to make some birthday cards, pulling a sentiment stamp from the previous Stamp of Approval Young at Heart release. I think it goes perfectly with this hot air balloon, what do you think?!!! I created 4 cards while I had my supplies out. Trying to build up my birthday card stash! I was inspired by the sketch over at CAS(E) this Sketch. And another similar card, but I added a bit of interest by cutting down the top layer and adding a stamped border to the side. This one uses a sentiment from the collection! 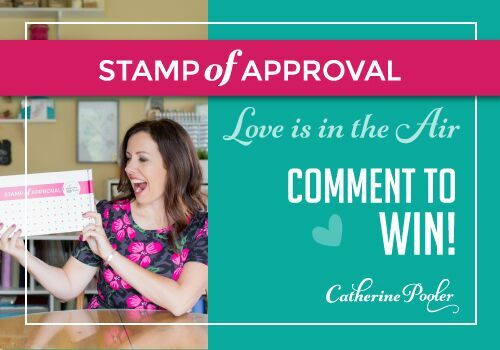 Today is Day 2 of the Stamp of Approval Love is in the Air Collection Blog Hops! 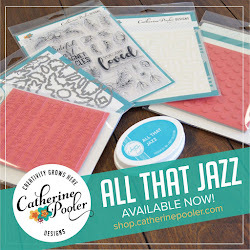 I am not officially part of the blog hop for today, but I have more cards to share with you all. My first card features the Love die, the Happiness Enclosed Stamp set & the forever sentiment from the Love is in the Air Stamp set. 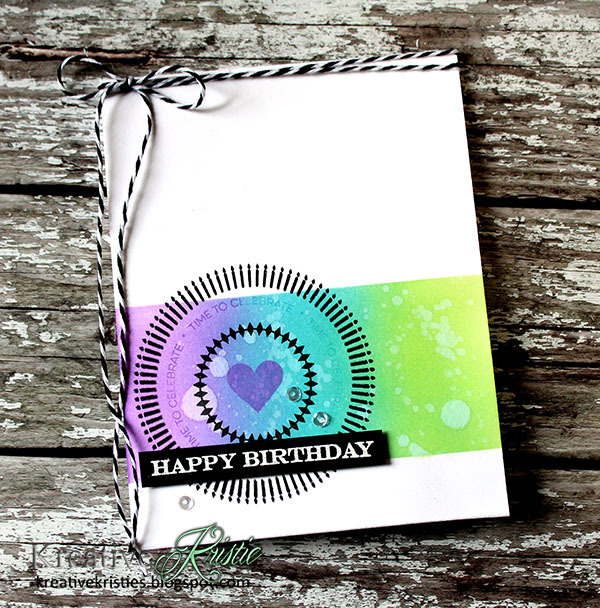 I had some comments left yesterday on my blog post about how I get my stamping in a straight line, I definitely use my MISTI for that. That is how I got these hearts lined up perfectly. After stamping the hearts, I filled in with one of the tiny hearts from the Love is in the Air stamp set. I die cut the Love die from silver glimmer paper and black card stock to add a shadow behind the silver paper. I just love the stamps that you can use to coordinate your envelopes. So fun! My next card features The World Awaits Stamp Set & the Postage Stamp dies. I love using the emboss resist technique with The World Awaits stamp set. I used the party inks in rainbow colors and some masking to create the rays. I created a frame to place around the edge of my card with the Postage Stamp dies. I know I will find myself reaching for these dies again and again for many cards. 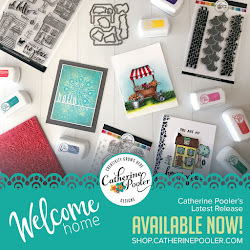 Make sure you start today's hop over on Catherine's blog>>>HERE<<<and if you missed Day 1 you can start>>>HERE<<<! Remember to comment on each stop along the hop for your chance to win the collection. Love is in the Air Stamp of Approval Blog Hop Day 1 & Giveaway! Hi everyone! 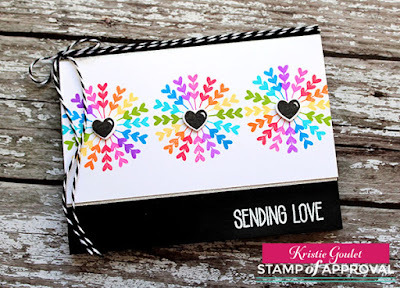 Welcome to Day 1 of the Love is in the Air SOA Collection Blog Hop! 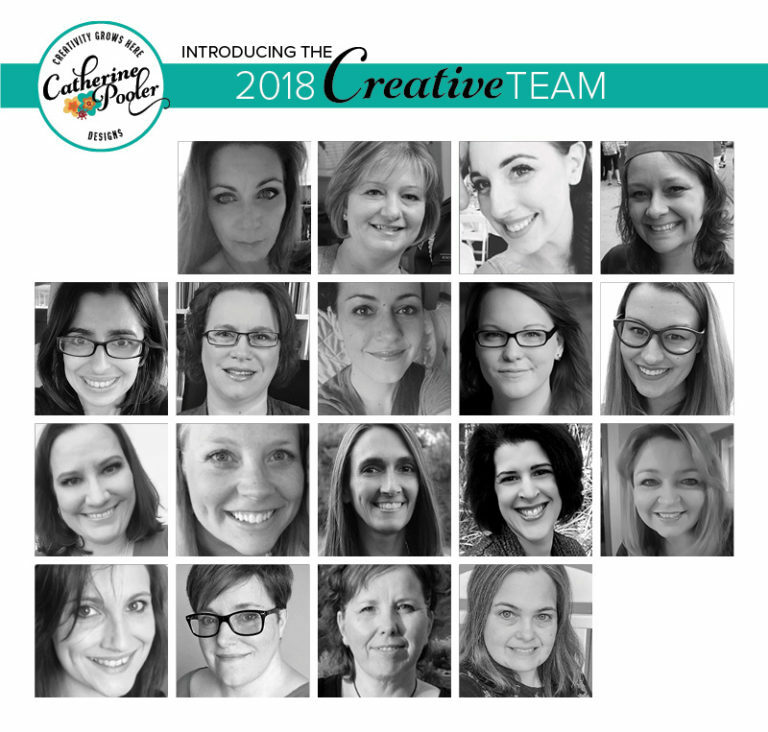 You should have arrived here from Justine Hovey's blog. The complete list is below if you get lost along the way. The collection goes up for sale on Tuesday, January 9th at 9am to those on the Wait List. 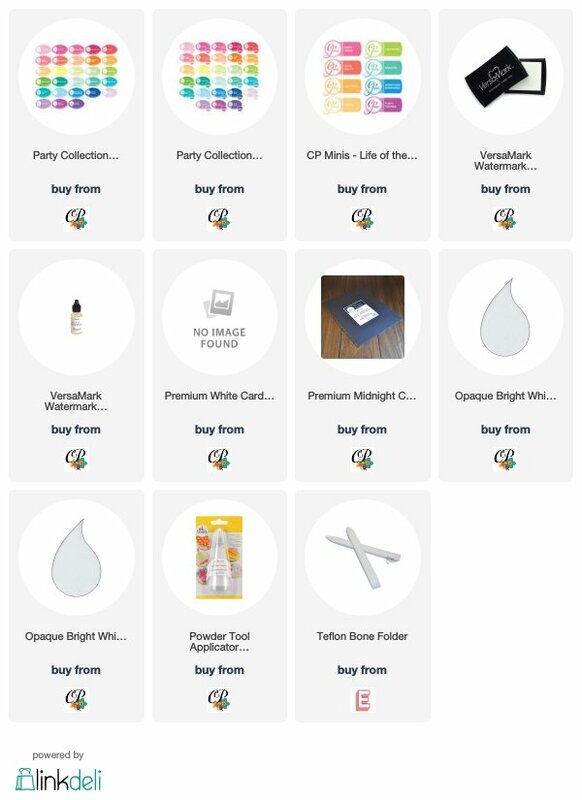 The box contains products that can be used together to create many different cards. 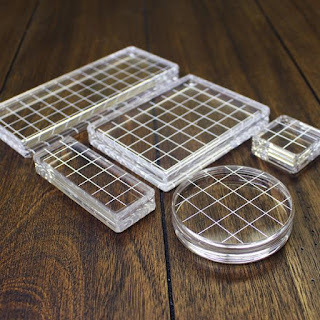 They can also be used along with products you already have in your stash! Awesome!!! I have had a blast creating cards using this collection. 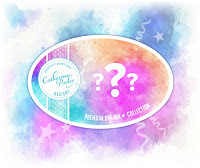 AND included in this collection is a NEW Mystery Ink!! Any guesses as to what color it may be?? I am in love with this "arrow" stamp with the hearts on the ends. 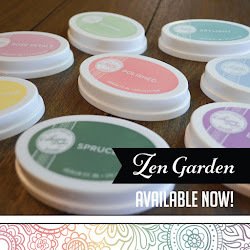 Stamping it with all the Spa Ink colors was the perfect combination! 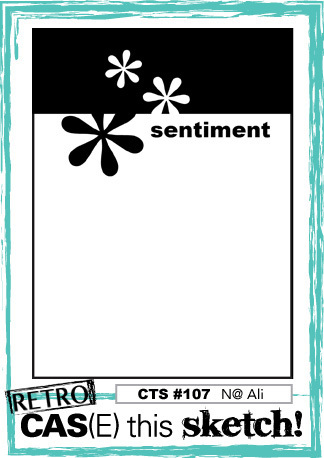 Along with a white heat embossed sentiment from the Bon Voyage stamp set! I could see recreating this card with so many different color combinations and maybe even switching out the sentiment to a Happy Birthday that you have in your stash or the Miss you sentiment that also comes in the stamp set. My second card features the Love is in the Air stamp set/coordinating dies, the Postage Stamp dies and the Happiness Enclosed stamp set for the coordinating envelope. 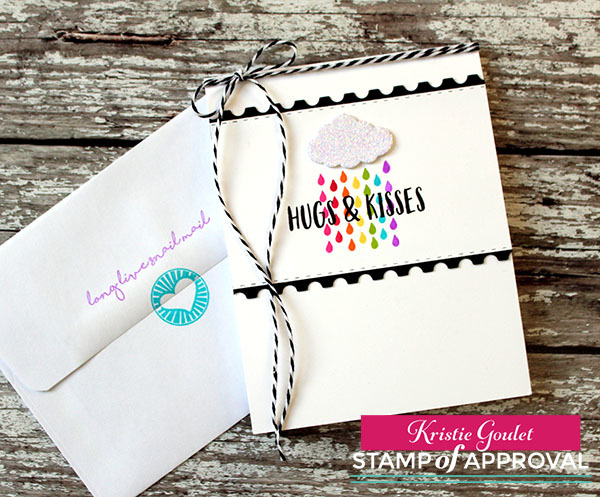 I wanted my card to showcase the adorable cloud die and raindrops from the Love is in the Air stamp set and dies. 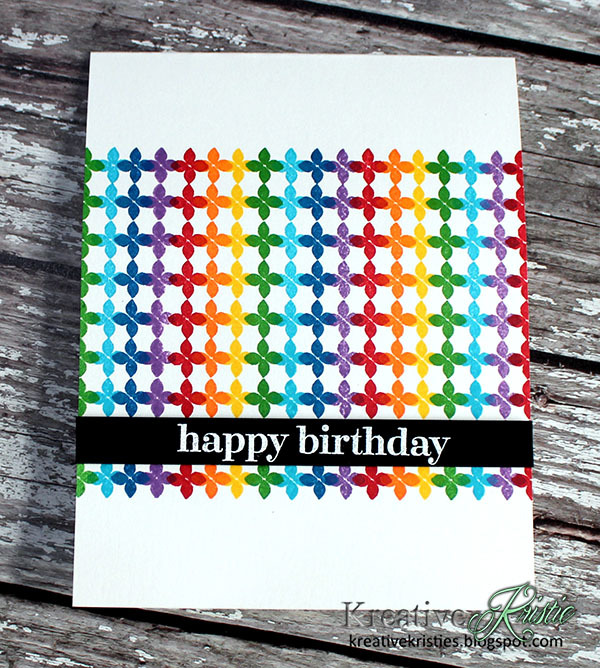 I couldn't resist stamping the rain drops in rainbow order using the Party Collection of inks. 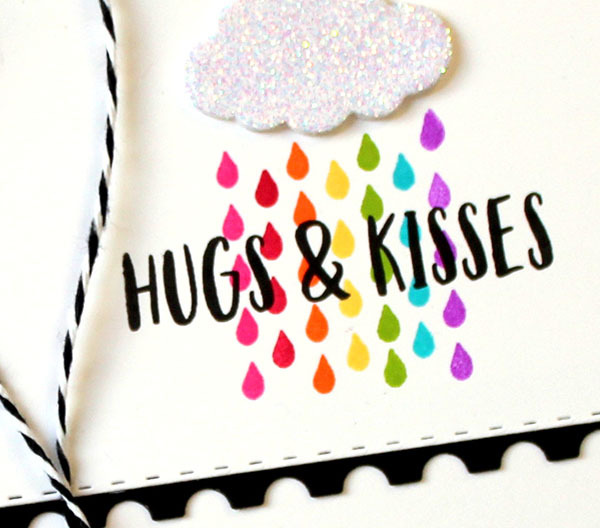 The Hugs & Kisses sentiment was stamped over the raindrops using Midnight Ink. To add some interest to my card, I added some strips of the biggest postage stamp die to the top and bottom of my stamped panel. I also added the stitching to the top and bottom using the rectangle stitching dies that also come in the die set. To add some sparkle to the cloud I smooshed it in Versamark ink and added some Wanderlust embossing glitter and heat set it. It is so sparkly in real life. Here's a close-up to show the sparkle on the cloud. AND look at the coordinating envelope! I love the sentiments that can be stamped on the back of your envelopes. This one says "long live snail mail". The heart image also comes in the set. It's time now to start hopping along, BUT before you go, make sure you leave comments on each stop along the way for your chance to win! Your next stop on the hop is Karen! 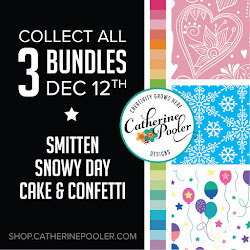 One winner will be chosen at random from EACH day's comments and announced on January 10th on Catherine's blog. 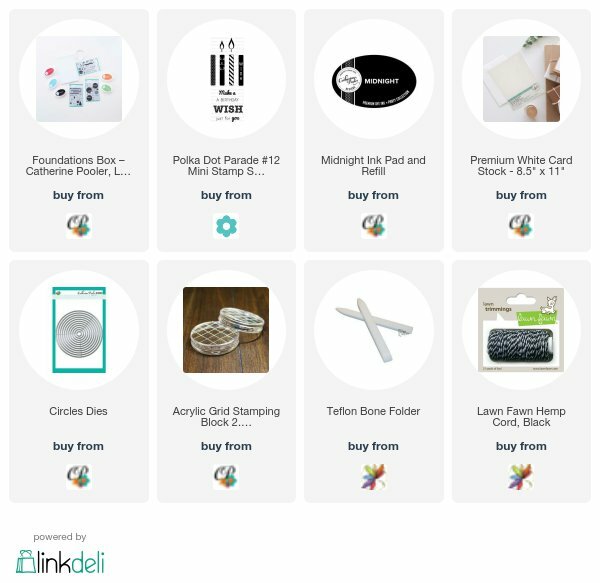 The winners will win their box and if you have already purchased it, you will be issued a Gift Certificate worth $100 towards a future purchase. Hi everyone! 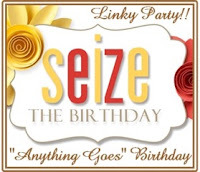 I'm super excited to have been asked by Nancy Leppeck of Scrapper@heART to be the surprise party guest over at Seize the Birthday! I love making and sending birthday cards to my family & friends! 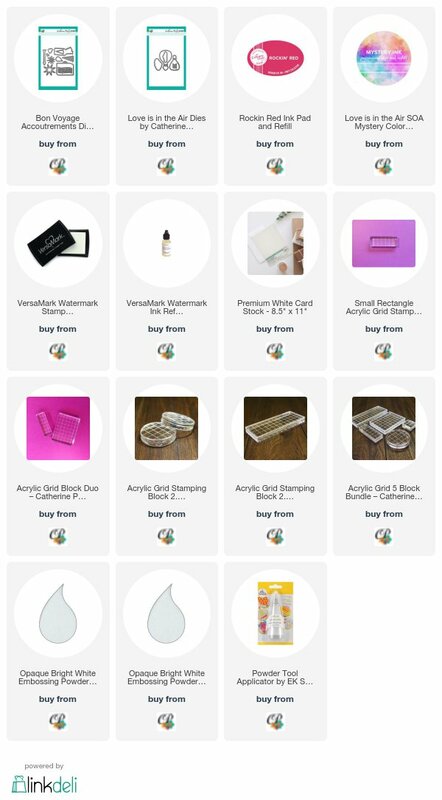 I tend to make mostly birthday and Christmas cards so this was definitely an honor and playing along with these challenges are a great way to keep my stash growing. 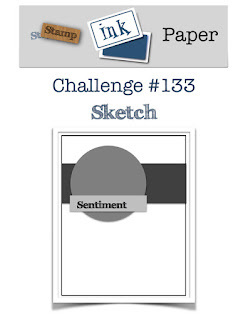 Each week is a different "topping" (challenge theme) to use for your designs. You don't necessarily have to use the toppings to play along though - any birthday card works. This week is "no topping" so just create any ole' birthday card and link it up! FUN & EASY, right?!!! 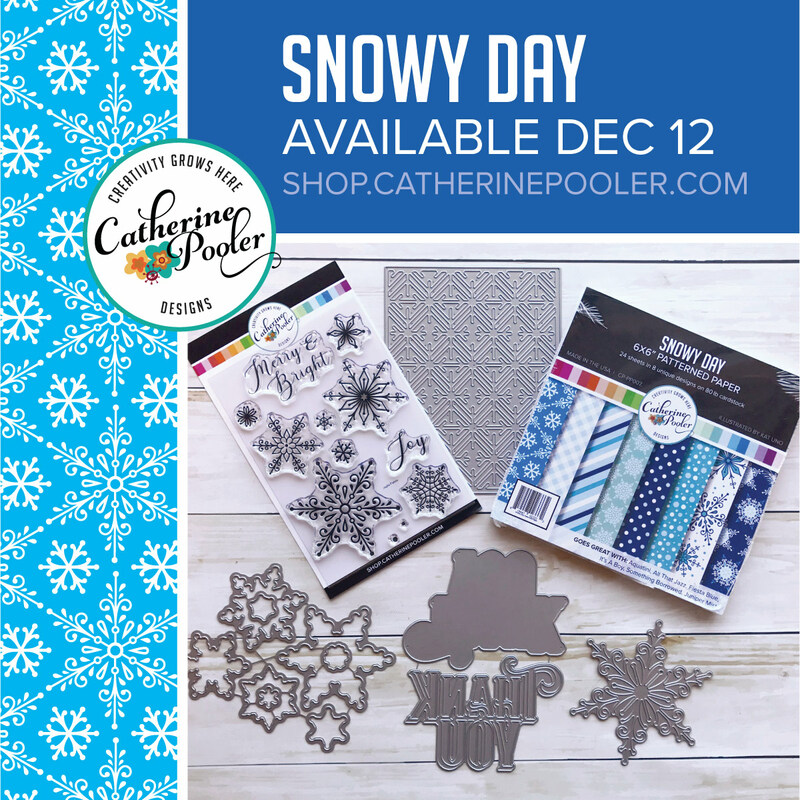 I was inspired to create some winter birthday cards using the Mix & Mat: Snowflakes Die by Papertrey Ink. I tried really hard to capture the sparkle paper I used behind the die cut, but just couldn't capture it. Trust me, it's so sparkly in real life. I embossed the biggest layer die onto the card base for added texture. The sentiment is from Keep it Simple: Birthday also by Papertrey Ink. 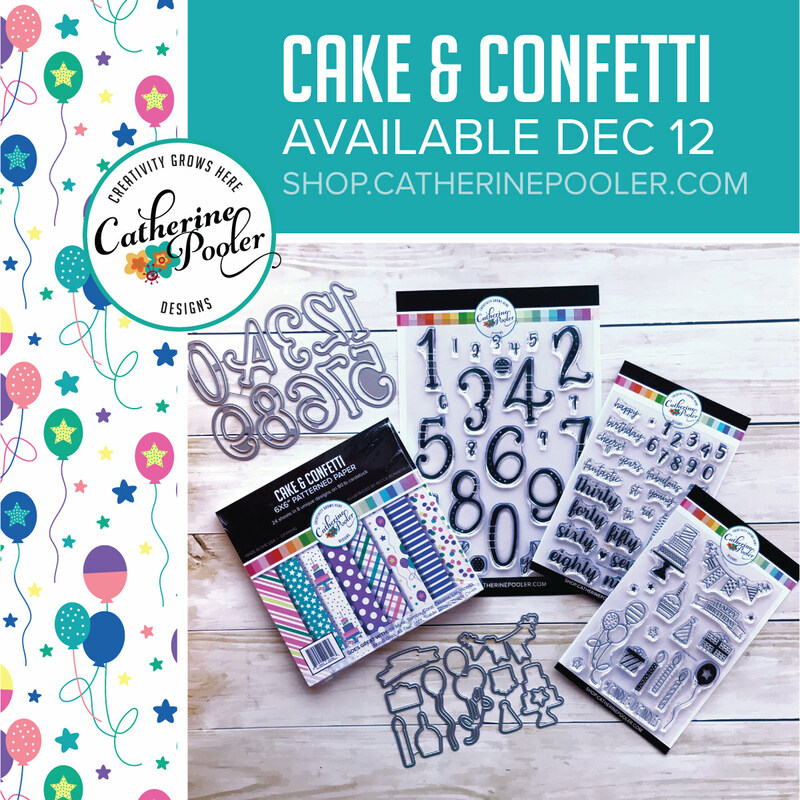 I sure hope you will play along this week and get a head start on those birthday cards for this year. Happy New Year everyone! I am SO excited to announce that Catherine Pooler Designs has a brand new 2018 Creative Team!!! I am humbled & honored to be one of these team members! 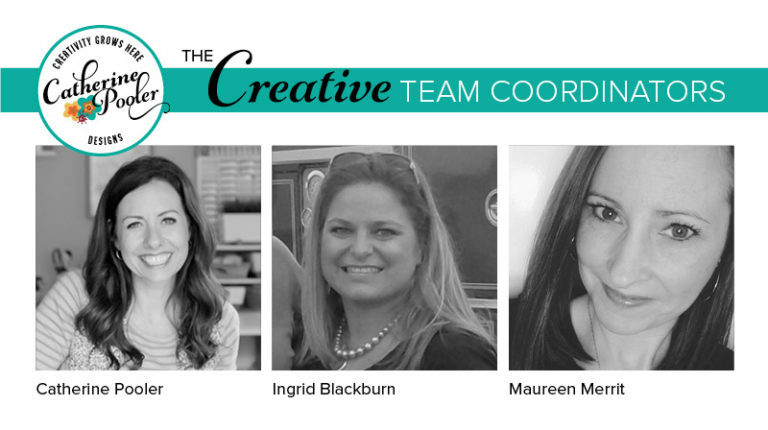 AND our awesome Creative Team Coordinators! 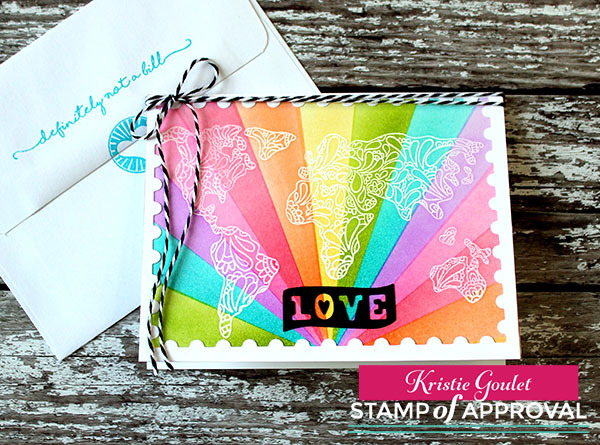 I cannot wait to share what I have been working on for the next Stamp of Approval release coming January 9th! 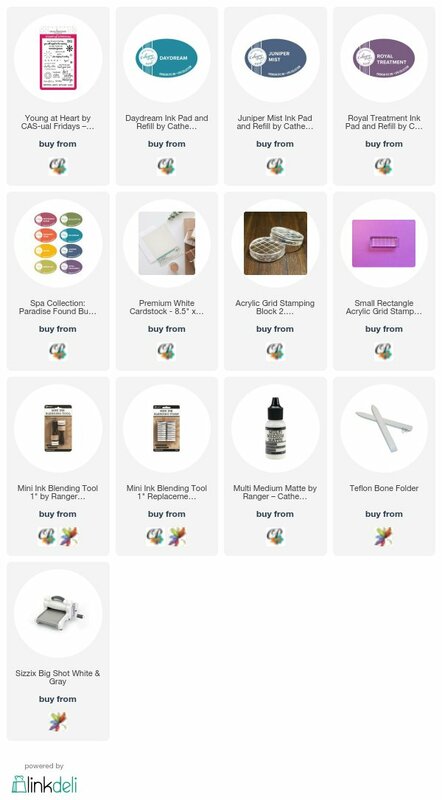 Get on the Wait List >>HERE<< so you can grab your box as soon as they go on sale! These boxes are known to sell out very quickly! 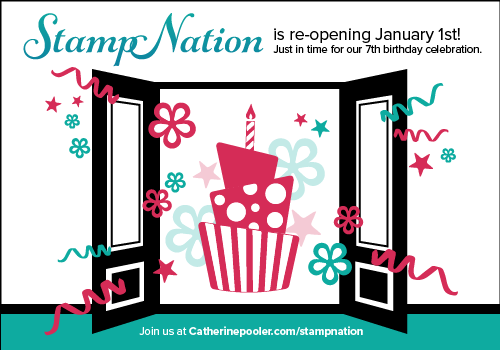 We are also celebrating big over on StampNation! StampNation is over on it's new platform and will be celebrating it's 7th Birthday! Click >>HERE<< to join today and for more info!